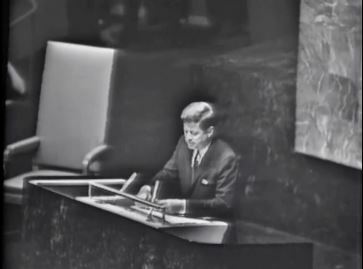 On September 25, 1961, President John F. Kennedy addressed the United Nations on topics of international disarmament, Weather Control, worldwide communications systems and a ban on Atmospheric testing. As we extend the rule of law on earth, so must we also extend it to man’s new domain–outer space. All of us salute the brave cosmonauts of the Soviet Union. The new horizons of outer space must not be driven by the old bitter concepts of imperialism and sovereign claims. The cold reaches of the universe must not become the new arena of an even colder war. To this end, we shall urge proposals extending the United Nations Charter to the limits of man’s exploration of the universe, reserving outer space for peaceful use, prohibiting weapons of mass destruction in space or on celestial bodies, and opening the mysteries and benefits of space to every nation. We shall propose further cooperative efforts between all nations in weather prediction and eventually in weather control. We shall propose, finally, a global system of communications satellites linking the whole world in telegraph and telephone and radio and television. The day need not be far away when such a system will televise the proceedings of this body to every corner of the world for the benefit of peace.